Several years ago I was challenged in my faith to examine the claims of a different religion. This other church insisted that it alone was pleasing to God and that my religion was wrong. I spent many hours each day studying both my own faith and the claims of the challenging faith. I would compare and contrast the teachings of both, endeavoring to come to a firm knowledge of the truth. However, throughout this extended period I could sense God asking me, “But who do they say that I am?” The answer to this question was the key to whether their claims were true or not. God had told me, through the prophet Isaiah, certain things about Himself so I would “know and believe” and “understand” who He is; and this so I could evaluate claims people would make in His name. The knowledge given through this Scripture verse, that there is only one true God – and will never ever be any others – became the anchor that held me firmly to the truth when I was being tempted to turn away and follow after a different God. The Word of God is very precious to me; I thank my Father in heaven that He kept me from deception and helped me to see the foundational flaw in that other church, The Church of Jesus Christ of Latter-day Saints. My submission was never chosen for publication in Church News and “Living by the Scriptures” is no longer a regular feature in the Mormon newspaper. But I like the idea promoted by the column. To speak of the way God and His Word has been active in our lives is always a good idea. 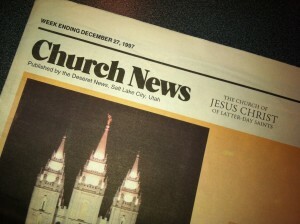 Therefore, I invite you, friends in the Mormon Coffee community, to carry on that old Church News tradition. You may tell us here, or you may tell those people God brings across your path in person, but along with Daniel, those of us who love God should all agree, “It has seemed good to me to show the signs and wonders that the Most High God has done for me” (Daniel 4:2). This entry was posted in Bible, God the Father, Truth, Honesty, Prayer, and Inquiry and tagged Discernment, Isaiah 43:10, One True God. Bookmark the permalink. “Far from being the passive participant portrayed in his official history, he was an aggressive, ambitious leader among Manchester’s treasure seekers. In addition to locating treasures through the use of mineral rods and seer stones, the Smiths employed various forms of magic in an attempt to dislodge stubborn treasures from the grasp of their guardian spirits. That Joseph Sr.’s personalized and heterodox religious views incorporated folk magic beliefs was something that Lucy did not deny. Evidently aware of the criticism of indolence that was leveled against the treasure seekers, Lucy declared in her preliminary manuscript – “Let not my reader suppose that because I shall pursue another topic for a season that we stopped our labor and went at trying to win the faculty of Abrac, drawing magic circles, or soothsaying to the neglect of all kinds of business. We never during our lives suffered one important interest to swallow up every other obligation.” Concerned that her family appeared to be lazy, Lucy nevertheless confirmed that they were involved in treasure searching, magic, and the occult. It was more than Joseph Jr. was willing to admit.” [..] Dan Vogel, Joseph Smith The Making of a Prophet, pages 35-36. From the Palmyra (N. Y.) Reflector — Printed abo[u]t two miles from Smith’s Bible quarry. It is well known that Jo Smith never pretended to have any communion with angels, until after a long period after the pretended finding of his book, and that the juggling of himself or father, went no further than the pretended faculty of seeing wonders in a “peep stone,” and the occasional interview with the spirit, supposed to have the custody of hidden treasures; and it is also equally well known, that a vagabond fortune-teller by the name of Walters, who then resided in the town of Sodus, and was once committed to the jail of this county for juggling, was the constant companion and bosom friend of these money digging impostors. There remains but little doubt, in the minds of those at all acquainted with these transactions, that Walters, who was sometimes called the conjurer, and was paid three dollars per day by the money diggers in this neighborhood for his services, first suggested to Smith the idea of finding a book. Walters, the better to carry on his own deception with those ignorant and deluded people who employed him, had procured an old copy of Cicero’s orations, in Latin, out of which he read long and loud to his credulous hearers, uttering at the same time an unintelligible jargon, which he would afterwards pretend to interpret, and explain, as a record of the former inhabitants of America, and a particular account of the numerous situations where they had deposited their treasures previous to their final extirpation. So far did this impostor carry this diabolical farce, that not long previous to the pretended discovery of the ‘Book of Mormon,’ Walters assembled his nightly band of money diggers in the town of Manchester, at a point designated in his magical book, and drawing a circle around the laborers, with the point of an old rusty sword, and using sundry other incantations, for the purpose of propitiating the spirit, absolutely sacrificed a fowl, (Rooster) in the presence of his awe-stricken companions, to the foul spirit, whom ignorance had created, the guardian of hidden wealth; and after digging until daylight, his deluded employers retired to their several habitations, fatigued and disappointed. Abner Cole, The Painesville Telegraph, Tuesday, March 8, 1831. Presidet Young also said that the seer stone which Joseph Smith first obtained He got in an Iron kettle 15 feet under ground. He saw it while looking in another seers stone which a person had. He went right to the spot & dug & found it. [..] Wilford Woodruff’s Journal, Vol. 5, p. 383, September 11, 1859. The stone that Jo looked into to find his first peep-stone belonged to Sally Chase, notorious for her occult practices and scrying. In this general chorus of agreement the non-Mormon sources join. Orasmus Turner remarks that Joseph caught “a spark of Methodism in the camp meeting, away down in the woods, on the Vienna road,” to the point of becoming a passable exhorter in the evening meetings, while Pomeroy Tucker says that Joseph went so far as to join the probationary class of the Methodist church and make some active demonstrations of engagedness, though his convictions were “insufficiently grounded or abiding to carry him along to the saving point of conversion,” and he soon withdrew. The exact date Joseph turned his back on the high promise the revivals had held out to him can only be guessed, but most probably by the early summer of 1825 he had withdrawn altogether from the embrace of the Methodist church. When he went off to the Susquehanna country that fall, he could take up his glass-looking again with an untroubled heart. Joseph had not easily been persuaded to yield up the details by which the integrity of his account of himself may be appraised. To importunate followers in 1831 he said shortly that “it was not intended to tell the world all the particulars of the coming forth of the Book of Mormon; and…it was not expedient” for him to relate these things. Joseph would best have held to that ground. The progressive enlargement of his story, climaxed finally in the breathtaking vision of the Father and the Son, involved him in difficulties that ended by setting reality at complete defiance. He committed himself very early to the thesis that he had been visited by an angel in 1827. When Joseph shifted his ground in 1834-35, drawing upon the troubled emotions of the revivals to give verisimilitude to his account of his visions, the revival of 1824-25 was wrenched out of its proper context and dated back to 1823, for it was logically impossible that Joseph’s awakening to religion should have been delayed for months after the Angel Moroni appeared to him. From this position it was only a step to the final ground he occupied, the revival moved back in time three more years, and his sanction found in the Father and the Son themselves. How is it possible that Joseph’s followers accepted all that he chose to tell them, never doubting, deaf to inconsistency and blind to impossibility? A Mormon authority has given an answer of a kind: “Our fathers and our people in the past and now, were and are uncritical. They have been and are now—and to their honor be it said—more concerned with the fact of the divine origin of the Book of Mormon and the great work it introduced than [with] the modus operandi of its translation. Overwhelmed by a divine testimony of its truth they have paid little attention to the precise manner by which it was brought forth.” It was emotionally impossible for the Saints to challenge the integrity of their prophet, in the matter of his early life or anything he chose to tell them. If deceived in anything, it might be that they were deceived in everything. The whole power and discipline of their faith conditioned them to belief. Yet their own responsibility in the make of their prophet, in the proliferation of his legend, is not to be dismissed. Their hunger for miracle, their thirst for the marvelous, their lust for assurance that they were God’s chosen people, to be preserved on the great and terrible day, made them, hardly less than Joseph, the authors of his history. His questionable responsibility is the faithful image of their own. [..] John Phillip Walker, Dale Morgan on Early Mormonism, p.258-260. NOTICE. The young people of the village of Palmyra and its vicinity are requested to attend a Debating school at the school house near Mr. Billings’ on Friday next.” Notice dated 19 Jan. 1822. Jo caught his “spark of Methodism” in 1822, after he joined the juvenile debating club in January of that year. There was no “vision” in 1820. I feel, as many others do, that the Trinity is pretty clear what God is and is not. What we are unsure of is more of the how he is. More word games what versus how? The God to Orthodoxy is the same as the God to the Catholic, Anglican, Presbyterian, and many other Protestant Churches. And unless you believe there is more than one God then it’s the same God of LDS. We seem to argue about semantics on how the Godhead is unified and yet the persons are distinct. The God of Orthodoxy is not nature or substance. The nature is the uniting factor. The Father, Son, and Holy Spirit have the same will, so yes it is a God of one will and three distinct persons or consciousness. Now here’s where you’re waffling on the definition..understandably since the Trinity doctrine is paradoxical.. You originally said God was one only in nature which would not be very different than LDS point of view, but now you adding a singular will, which in essence would mean the it would also have a singular conscience, as I can’t think of a way you can have a will without conscience. Therefore I hear you now saying God is a singular being with will and conscience. Yet you are also saying it’s three distinct persons (beings) and consciousness which is logically impossible.. The paradox emerges. So the distinction of the LDS Godhead would be that as we agree the Three are separate and distinct personas, with distinct conscience and will, sharing divine nature, we don’t attempt to say the Three are ONE singular being with will and conscience, but yet the act in unity as ONE being through the principal of Divine Investiture”. The Godhead then is the same Father, Son and Holy Spirit and for all practical purposes are ONE, but no paradox. You need to get over putting God in a box. The creation will never fully understand its creator. I’m not putting God in a box. I’m simply exposing the paradoxical nature of the Trinity Dogma. It’s really not a big deal for me as I said before.. I still view my dear friends who believe the Trinity doctrine as “Christian”, and they view me as Christian as well.. It’s the those like MRM and other ministries that propagate the notion that even though LDS a very much followers of Christ by any objective measure, LDS aren’t ‘Christian’ because they don’t affirm the Trinity dogma. Which to me is nothing more than some here hypocritically holding on to ancient Roman empirical (Not Christ like) discrimination against those who don’t conform to the Orthodoxy. We don’t have a where God came from because the Christian God is without end and without beginning. He has existed for all eternity. There has never been a time without God. He is outside time. He is outside of the linear time frame. This is because you introduce an “infinity” into your concept of God. What has happened since biblical times is the concept of what “Eternal” means has evolved to involve an infinity. LDS also believe very much the same.. God is Eternal, and the Eternal realm where God came from is quite possibly a different space/time, not of this universe as we know.. Therefore he is without beginning and without end as relative to the space/time of the universe we exist in.. What we don’t do is insert an “infinity” into meaning of Eternal or the nature of God. And such an approach would be consistent with the Biblical text, and the context in which they Biblical writers would have written it. If you haven’t read C.S. Lewis, Mere Cristianity, please do. I have the book and read it a long time ago.. C.S. Lewis is known for having views very similar to LDS BTW and is often cited by LDS. Now here’s where you’re waffling on the definition..understandably since the Trinity doctrine is paradoxical.. You originally said God was one only in nature which would not be very different than LDS point of view, but now you adding a singular will, which in essence would mean the it would also have a singular conscience, as I can’t think of a way you can have a will without a conscience. Therefore I hear you now saying God is a singular being with will and conscience. Yet you are also saying it’s three distinct persons (beings) and consciousness which is logically impossible.. The paradox emerges. I’m really done with this topic so this will be my last comment. <"You originally said God was one only in nature which would not be very different than LDS point of view, but now you adding a singular will, which in essence would mean the it would also have a singular conscience, as I can’t think of a way you can have a will without a conscience." I'm sorry that you can't grasp the difference between will and conscience. As I have stated before to be with God we will all have to give up our independent will and all have the same will but we will be distinct persons. Will is intent and desire. When I say conscience I am talking about your distinct inner voice. Yes, Christianity is a paradox. Not just the Trinity, but the whole thing. Just because it's a paradox that can't be explained with the limited capability of human brains doesn't mean its not true. As we have covered, Mormonism is not immune to paradox. Maybe the Godhead in LDS terms isn't a paradox to you but the whole reason on why the LDS is a god to begin with is a paradox. I'm not sure your argument against the Trinity favors LDS theory. Both end in paradox! <"I’m not putting God in a box. I’m simply exposing the paradoxical nature of the Trinity Dogma." Yes you are, you only want to believe what you can explain. You limit God by your own limitation. And again, Mormonism isn't free of paradox. <"More word games what versus how?" Word games? You never learned the difference between the word "what" and the word "how?" I can say I know what a car is but not how it works. <"This is because you introduce an “infinity” into your concept of God. What has happened since biblical times is the concept of what “Eternal” means has evolved to involve an infinity." I'm not buying your whole infinity and eternal argument and I'm not sure many others are as well. "Without measure," to me means infinity. The definition wasn't "not able to be measured by human means." If it can't be measured by anything, even God, it's infinite. God being infinite is one of the beauties of Christianity. Just because I can't understand infinity doesn't mean I don't believe in it. <"I have the book and read it a long time ago.. C.S. Lewis is known for having views very similar to LDS BTW and is often cited by LDS." These views he has are Christian views, not unique to Mormonism. He wasn't preaching a different gospel with new ideas, he was preaching Christianity. If you like some of his ideas, realize they were and are still with Christianity to this day. I recommend him because of his description of the Trinity. You might need to reread him because a lot of the things you bring up, he talks about. You keep thinking I am misrepresenting something. Read it from his book and tell me if I'm saying different. But on a different post, cause like I said, I'm done commenting here. Sorry, I meant to say this as well in the last post. Just in case someone says Christianity isn’t a paradox. Explain the inner working of the atonement. Not just an overview on what happens but the very inner workings of the whole thing. I feel like these are the type of questions Mormons bring against the Trinity. We can tell you what but can’t go into the very details so that it is all perfectly clear. If anyone says they perfectly understand the atonement, I think they are lying to themselves. Just as I don’t totally understand the atonement, I don’t perfectly understand God. But even though I am without a perfect understanding, the reality of the two does not change. Why do you continue with this ridiculous debate, I get the impression that it is far easier for you come up with fascinating, albeit at times rather ridiculous theories than to answer the simple comments I have put to you several times. If you continue to ignore what I have said or fail to come up with a coherent reason as to why I am wrong then you are wasting your time & everyone elses. You claim to be Christian yet you reduce our God to the status of the LDS god/man by your constant need to show everyone that the Trinity doctrine is false. You are in effect telling us that no matter what God says about Himself it can’t be true because you can’t understand it. Your attitude is very similar to the atheists who have come to me over the years saying that such & such cannot be true because it doesn’t make sense to them. Such arrogance from a man who claims to know God! You seem unable to grasp the fact that God is beyond our understanding. I’m tired of seeing arguments about singularities or black holes, I’m tired of reading that eternal or infinity mean this or it means that. Just answer a couple of very simple question & let’s be done with it yes or no will suffice. Do you know & understand God in a much deeper way than any Christian who has ever lived? Do you believe that your intelligence carries greater weight than Gods word? Ridiculous? The only thing ridiculous is the Trinity Dogma, and the practice of using it as a means of pejoratively discriminating against various Christian faiths as is done here a MRM to claim they can’t be called Christian because they don’t agree with the doctrine.. That’s what’s ridiculous. Yes, I said ridiculous, your intention is to deride & disprove the nature of God as revealed in scripture, you attempt to use human reason to disprove the divine & that makes it ridiculous. Rather than responding to my argument you avoid mentioning it at all, typical LDS evasion tactics. You will make a much better impression if you, rather than using “long words”, just answer the questions, yes or no. Ps. All Christian faiths accept the doctrine of the Trinity so I can only assume that you’re telling us you’re not a Christian. since our Creator above is so much greater than a mere human “exalted” male . Ocean , I think that Old Man is onto something . Much of what you have said is ridiculous . church of the Devil because they won’t accept the authority of the men who invented the dogma. Ocean by his own words has been busted and exposed as a lair and fraud, it is no wonder he cannot answer any questions. The only thing he appears to me to be on to is his own delusion driven by emotive antipathy against the LDS faith and he seems to have like minded individuals in his cheering section. In deed the forgoing is ridiculous, since there is no such thing as “Mormon trinity dogma” and NOr do Mormon’s claim other Christians are not Christians and belong the church of the devil. So indeed you statement is ridiculous. This thread has run its course. I will be closing comments here in the morning. Pease wrap it up, friends. and faulty assumptions in your responses here . Mormonism does have it’s own trinity dogma. reply about what Mormon authorities have said about others who claim to be Christians. your list of errors by denying it . Even more meaningless long words instead of simple yes or no answers. Just to let you know, the “emotive antipathy” expression you use is nothing of the kind, certainly I loath your false religion but emotion doesn’t come into it. It might be better if you used an expression such as antipathy based on cold hard facts.